I suspect that Jo Nesbo fans are good at cryptic crosswords. His dense, confusing plots are too much for my probably underheated brain to process. I also suspect that Swedish director Tomas Alfredson has made matters worse in his adaptation of Nesbo’s seventh novel in the Harry Hole series, The Snowman, by creating a two-hour puzzle where a lot happens on the surface – complete with confusing flashbacks – but disappointingly little stirs underneath. Nesbo’s enigmatic detective is played by Michael Fassbender with the emphasis on enigmatic. He’s an occasional drunk who we first meet sleeping it off in a bus shelter on a freezing morning in Oslo. The causes of his alcoholism, and much else relating to his inner self, is, however, stubbornly withheld from us. We do understand that he has been ditched by his previous girlfriend, Rakel (Charlotte Gainsbourg) although he retains a connection with her son (Michael Yates). 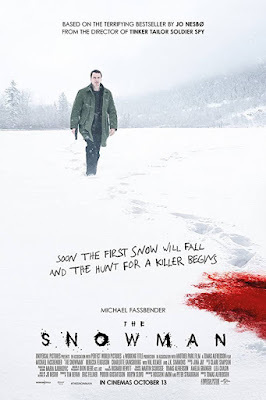 The dark centre of the movie concerns the bloody activities of a Norwegian serial killer who kidnaps women and then carves them up (an oblique prologue hints at who this man might be). Hole, who occasionally receives cryptic notes from the killer, joins up with bright newcomer Katrine (Rebecca Ferguson) to solve the case. The pair spend their time in Oslo and nearby Bergen trying to understand the killer and track him down as the body count begins to increase. Unfortunately, the haphazard structure of the film, and sometimes confusing machine-gun editing, makes it difficult for them to forge much chemistry. The killer’s signature is a rather tatty looking snowman which appears at the various crime scenes, but there are any number of red herrings on display to lead us astray, which makes it even tougher to decipher what’s going on. Other characters on the frozen stage include JK Simmons as a sinister mogul driving Oslo’s bid to host the Winter Olympics, and Val Kilmer who is barely recognisable as a dissolute detective investigating a potentially related case of murder years before. The fact that three people wrote the screenplay and two edited the film suggests a complicated production history and the possibility that fresh people were brought in to clarify what could have been an even messier initial product. My disappointment is accentuated by the fact that Alfredson was responsible for two of excellent films, the zombie drama Let the Right One In and his peerless adaptation of John le Carre’s Tinker Taylor Soldier Spy. The biggest concern, plot complications aside, is that the movie’s characters are difficult to get to know so it’s hard to care one way or another what happens to them. One compensation, if you’ve given up on the people and the plot machinations, are the splendid wintry landscapes which have been captured by cinematographer Dion Beebe.